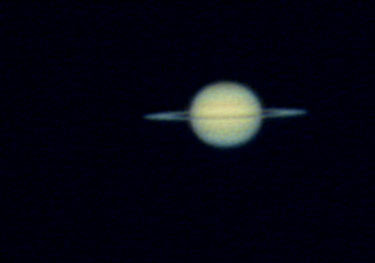 The last time I took some pictures of planet Saturn was 1 year ago in March 2008. How time flies when you’re waiting for weather good enough to get the telescope out! In fact these latest pictures were taken with the same webcam, but now with my new Celestron C6 SGT telescope. You can see several photos from the same observing session on my Astrophotography Photos of Planet Saturn page, demonstrating the the stages of different pre and post-processing techniques using K3CCDTools or Registax and Photoshop to improve on the basic images. This entry was posted on Saturday, March 21st, 2009 at 7:37 pm	and is filed under Astrophotography, C6-SGT, Observing. You can follow any responses to this entry through the RSS 2.0 feed. You can leave a response, or trackback from your own site. Spam protection: Sum of five + eight ?